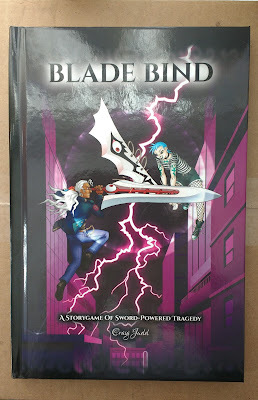 The Game Mechanic: Blade Bind's Final Form! Okay, that's not what the picture is actually of, but I recently locked down some of the major details in the way a game of Blade Bind progresses that crystallise it into a “final form”. 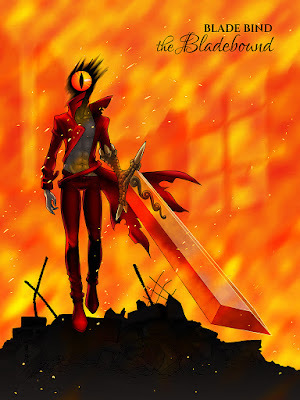 This is what happens to you if you lose control and let the Blade take over. The one part I still have to finalise is the Blade Techniques – special powers unique to each Blade. They will need a bit of fine-tuning and testing before they're ready, but they are minor details compared to the overall chassis of the game engine. And in fact, I needed to know all the details of how the game was going to work before I could make sure some of the Techniques would be suitable! I ran an in-person playtest a few weeks ago, and was hoping to run another to try out an alternative Will/Power progression structure, but game groups are proving hard to organise at the moment. After talking it through with Nette, who played in the aforementioned game, we realised that the alternative didn't look so appealing on paper for a few reasons. Having rejected it, that means I'm moving ahead using the rules from the previous playtest. One of the main issues I've been trying to fix is card inflation. In early versions of the game, you could choose to gain Power at the start of a Duel, and also gained it automatically on a loss. Since the number of cards you draw is equal to Power, it was easy to end up with eight-card hands before the game was even close to ending, which meant the fights dragged out without much extra enjoyment or strategy. In the new version of the rules, you start with three free Will. You can still choose to increase your Power at the start of a Duel. Each time you lose, you lose one of those initial points of Will. Once you run out of them, you gain a point of Power on a loss. The net result is the same, but you don't get the massive inflation of Power until you run out of your three starting Will – which also seems to be the point at which people are in danger of becoming Bladebound and triggering the end-game. It also helps address another early problem we had, where those who participated in the first scene gained a significant Power head-start. What's the big deal with Will and Power anyway? Well, if your Power ever goes higher than your Will, you become Bladebound – the Blade fuses with you and takes control, using you as a tool for its own vengeance while also laying waste to everything in its path. So, what's next? Apart from the Techniques, I need to go through and revise the manuscript a couple more times. I want to add a page about facilitating the game. The layout design is pretty much ready and waiting for the content, but I want to make sure I have the manuscript well polished before I start on that. And, of course, I need to do a bunch more illustrations.